Unfortunately, Google still isn't increasing the size of your free email allocation. While rival Microsoft is now apparently Very Serious when it comes to April Fool’s Day, banning customer-facing pranks, Google is famous for two April 1 launches. The first, Gmail, wasn’t a prank. The second, Pokemon Challenge, was—and then wasn’t, as it later evolved into Pokemon Go. Gmail will let you schedule an email to send whenever you wish. Gmail’s latest features aren’t nearly as consequential. To schedule an email within Gmail, you’ll need to pull down the “Send” button, which is now a drop-down menu. From there you’ll simply need to pick the time you want it to arrive. 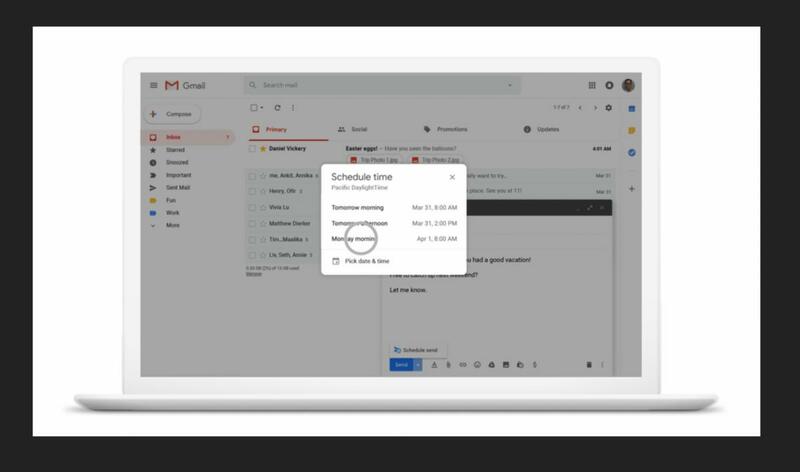 “We want to make it easier to respect everyone’s digital well-being, so we’re adding a new feature to Gmail that allows you to choose when an email should be sent,” Google said in a statement. Smart Compose, which was launched in May, 2018, is also being extended to the Gmail app, though only the Android version for now. Smart Compose actively tries to suggest or autocomplete phrases for you as you write, based on what Gmail knows about your past correspondence. In this version, for example, it might auto-suggest “Hey” as a salutation, if that’s the way you usually write, and suggest subject lines, too. Smart Compose is also adding support for four new languages: Spanish, French, Italian, and Portuguese. What this means for you: Smart Compose can be a somewhat polarizing feature. Sometimes I appreciate its ability to step in and autosuggest “it out” when I start typing “check.” Oddly, it probably should have been launched as part of Google’s mobile app before the desktop version, as that’s where I suspect the autocomplete feature is most frequently used. On a related note: Where were you when Gmail entered beta in 2004? The earliest a PCWorld employee can prove they joined was June 29, 2004 (me). Can anyone beat that? Search your Gmail archive for a welcome email from “gmail-noreply@google.com“ and check it yourself. If you’d like, you can attach a screenshot (black out out any personally identifying information!) to our Twitter feed as proof.